The B&G low-loss header, Model PSH, is a combination air separator and manifold that creates independent primary and secondary circuits. The B&G Model PSH is equipped with a purge valve allowing the user to remove any debris deposited on the bottom of the vessel and an air vent releasing trapped air in the system. The insulation, which is provided as a standard, prevents water vapors entering from the outside and eliminates the formation of condensate on the PSH body. 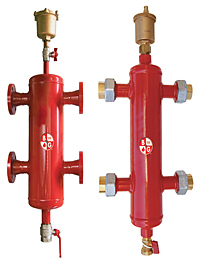 The B&G PSH saves time and money by simplifying the piping associated with traditional primary/secondary systems. Hydraulically separates primary and secondary circuits. Separates and vents air from the system. Separates and collects impurities in the circuits. Provides ease of installation. No complicated piping. Available in 1″ to 4″ connections. Epoxy resin painted steel body with brass air vents and drain valve.